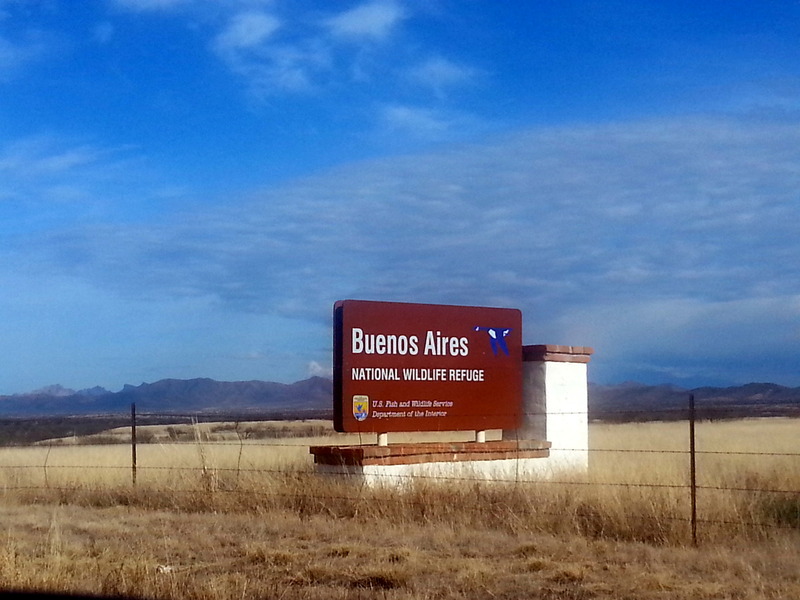 No, not that one….the one you’ve probably never heard of – Buenos Aires National Wildlife Refuge. This has been our home for the last three nights. Boondocking in the truest sense of the word. There is Nothing out here, and in the 80 or so campsites spread out in many square miles, we saw only about ten campers. Upon our arrival, we checked in at the Visitor Center for guidance as to a spot where we might be able to land the Fireball. It appears that many of the roads require high clearance vehicles, which we certainly don’t have. Good guidance directed us to site 36, with a magnificent view of Boboquivery, the sacred mountain. It’s amazingly quiet here (with the exception of the generator of our neighbors about 3/4 mile down the road). Coyotes park themselves right at the edge of our clearing every night and begin barking. Soon, the single coyote voice becomes two or three. It keeps Jezzy on edge, for sure – she’s happy to be moving on after sleeping with one wary eye open every night. 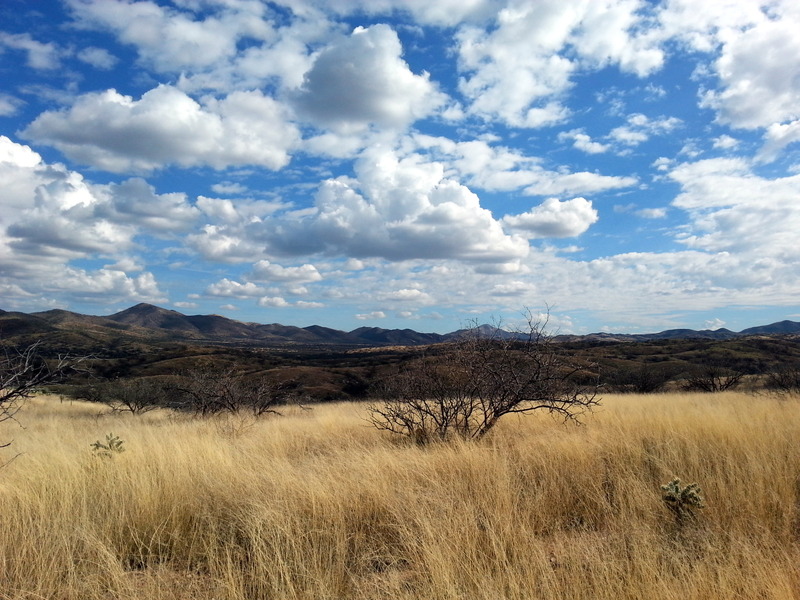 The NWR is a place of strange, remote beauty. Golden prairie grasses blow in the wind, and naked mesquite trees break up the prairie. 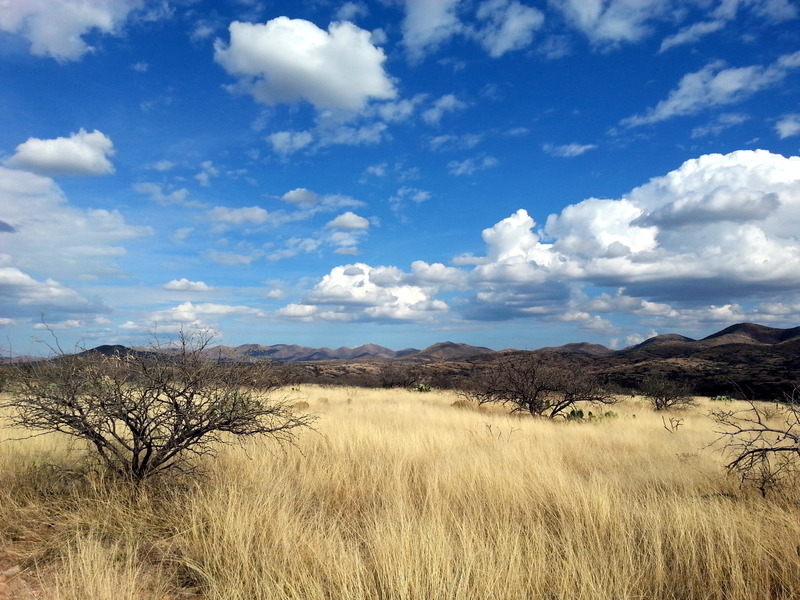 Like many areas of the Southwest, the story of the land here has been ranching, overgrazing, drought, and severe erosion once the rains began again. Stripped of the protection provided by the prairie grass, floodwaters carved deep trenches through the valley. 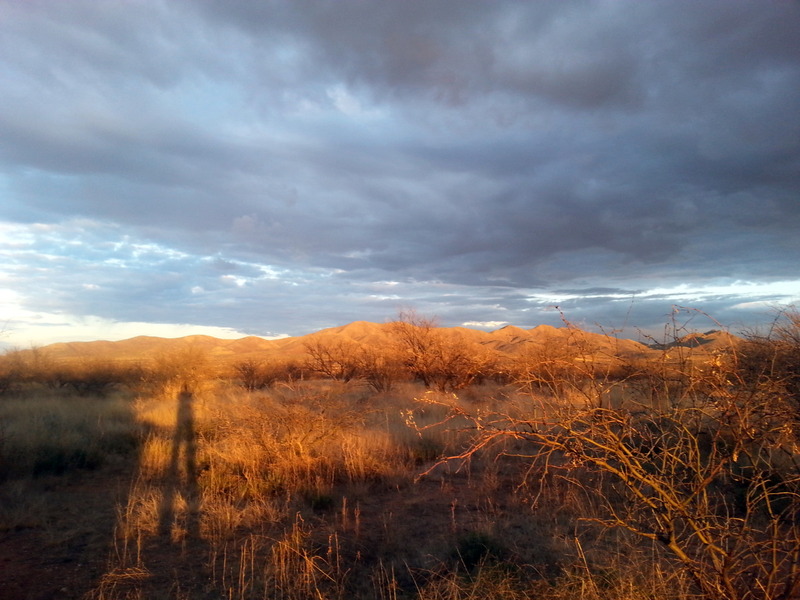 Mesquite trees were planted by the ranchers to halt erosion, but they quickly became an invasive nuisance themselves, competing with the grass for scarce water resources. On and on, the cycle repeated itself. 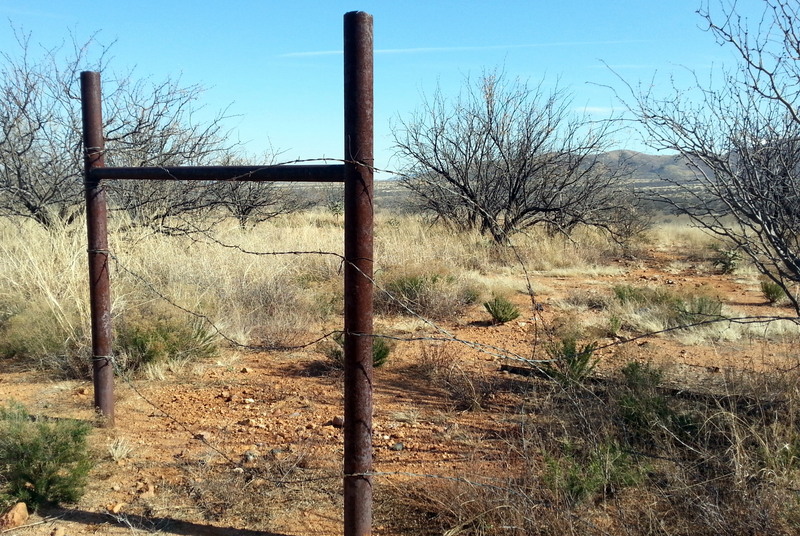 Remnants of the old ranching days are still visible, although most of the barbed wire has been removed to facilitate the re-establishment of an antelope herd. But, it is gorgeous here. We had miles and miles of gravel and dirt roads to explore on our mountain bikes. Often, the only people we would see every day were Border Patrol units, of which there were many. Helicopters and patrol planes are a constant presence. Strangely, we saw no wildlife. 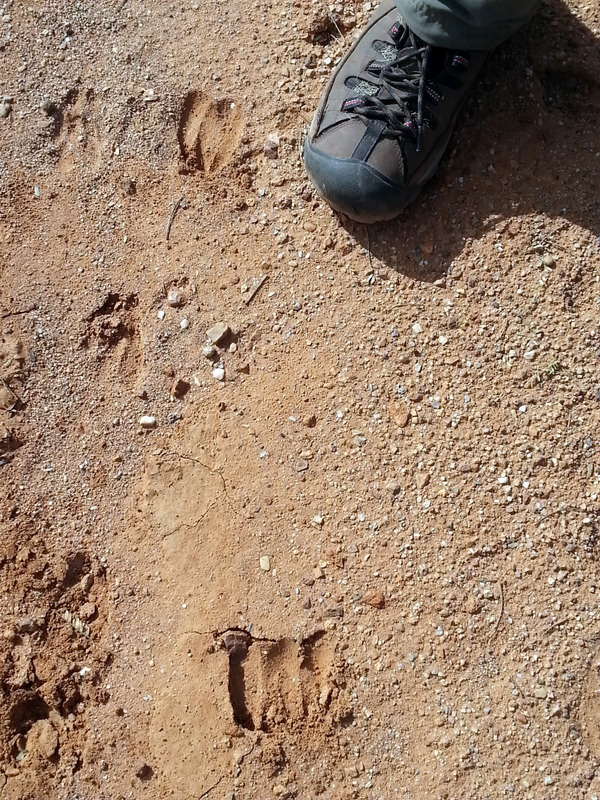 A few scattered birds, and tracks that we believe may have been javalina. 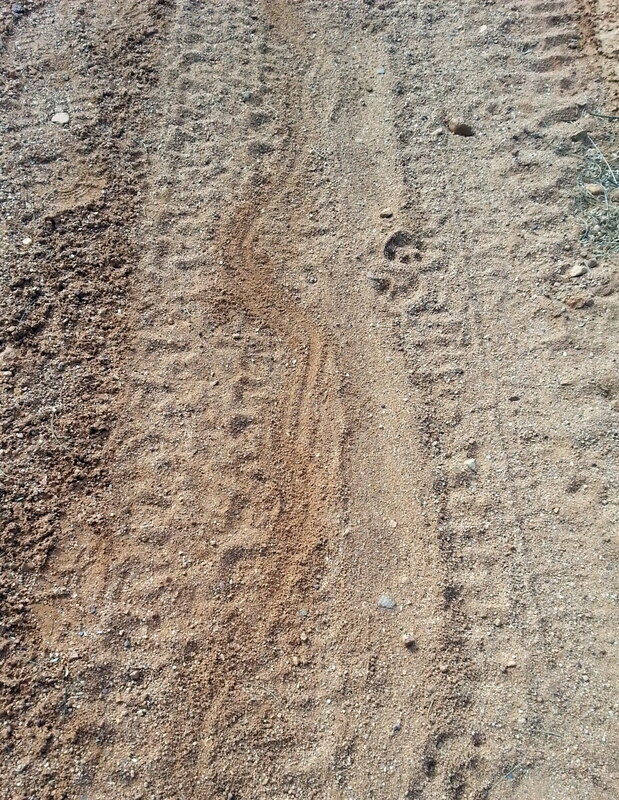 Perhaps this slithery track was made by a snake – perhaps a rope dragging from a vehicle. (Look right in the center – between the tire track marks). We cycled and hiked for three solitary days. Before our arrival, we loaded up with extra drinking water, and made sure our tank was full as well. 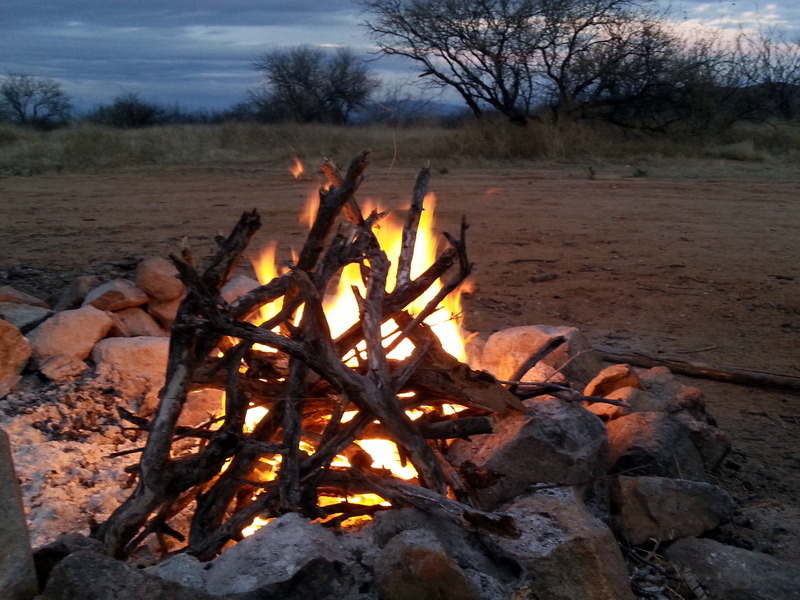 A pleasant surprise was finding that mesquite wood makes excellent campfires. It burns long and slow, with little tending needed. Guided hikes are offered in nearby Brown Canyon two Saturdays each month, so we signed up for one in mid-February. This is an area we haven’t hiked before, so we are looking forward to new sights and sounds next month. OK, now a couple of bitchy points. I understand that some folks smoke. OK. But, is it SO damned hard to throw your butts in the firepit? Quit throwing them wherever you damn well please! Another thing…..there are no toilets or waste facilities here. You pee and poop in the desert. But, do you think that means that you leave your nasty toilet paper (and whatever it’s covering up) laying around? Gawd. Get a grip, people. Get a shovel. Whew! I’m over that. 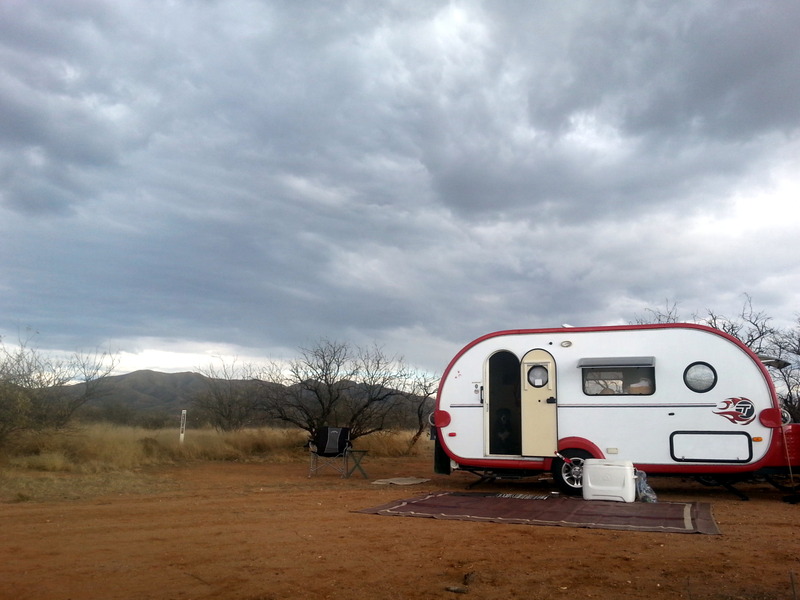 We’re moving on to Patagonia Lake State Park, in Patagonia, AZ on Monday. This is a well-known spot for birders, and we’re hoping to see a few species we haven’t seen before, and learn a bit as well. We hate saying farewell to our peaceful site here, but still are anxious to an area in which we have only passed through on bicycles in the past. 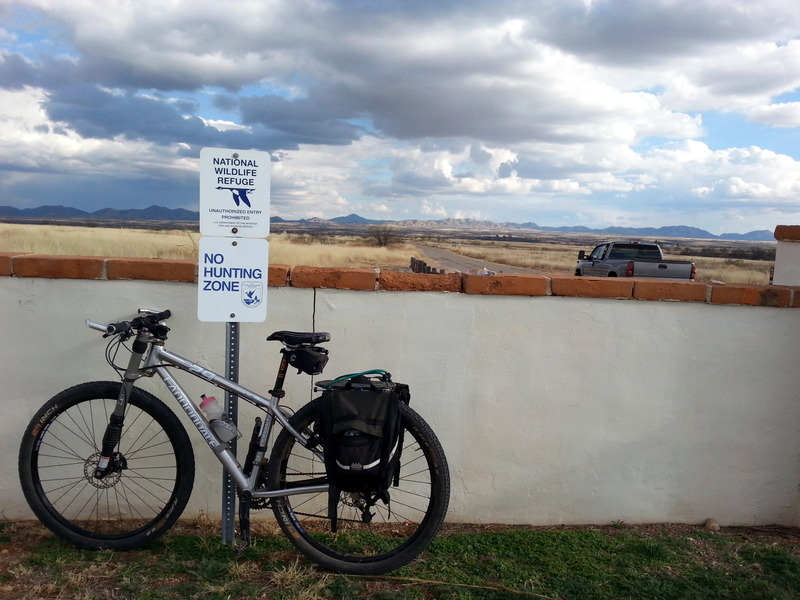 This entry was posted in Arizona, camping, cycling, retirement, road trip, RV life, T@DA and tagged Arizona, Buenes Aires National Wildlife Refuge, camping, cycling, historic sites, national parks, retirement, road trip by Judy Crankshaw. Bookmark the permalink. Every time I get a note from you, I want to go. In my mind I am riding with you every turn of the wheel. I wish we would have had a camera of today, when Nancy and I did our big trip in 1987. Stay upright and keep writing. Thanks, Jochen. I’m glad that its so easy to carry a camera these days. Its amazing to see folks everywhere snapping photos. Hope the snow let’s up so you can get on your bike soon. Some one is becoming quite the landscape photographer, these are beautiful! I’ve never had much of a desire to visit the desert southwest, but if it’s as pretty as it looks in your photos, I’ll have to change my mind about it. Good luck with the birds in Patagonia! There are some really nice spots in the desert, which represent themselves nicely in photos. For me, it’s pretty much just place + time + luck. What did I learn today? Birds are HARD! Compelling! That 5th photo draws me in and doesn’t want to let me go! The combination of the grass, tree, mountains and clouds couldn’t be more perfect. So glad to see you out doing what you love best! It’s great when things just line themselves up perfectly for your camera, isn’t it? I see it happen all the time in your photos, so you know what I’m talking about! Thanks, Sharon…..we are having a great time. Envisioning Jezzy sleeping with one eye open….guessing she’s happy to get a good night’s sleep :) Snake, chain, hummm, a mystery! Ready for my next stop…have fun! We are in love with all the stuff here that is so out if our usual element. Jezzy, not so much! Such desolate beauty. Why can’t some people seem to respect the land? It makes me want to punch people in the throat. What makes mesquite burn so well? Is it resins? Have a blast. Some people are thoughtless slobs, and it just becomes more noticeable when it’s in such a beautiful environment. We try to always leave a campsite in better shape than we found it. Guess that’s all we can do. Loved the pictures of the prairie grasses and landscapes. You go to such unusual “off the beaten path” places that a Google maps screen shot would be welcome just so that we can see where you might be. If it’s too much trouble then don’t bother :-) Is a 3 day stay boondocking , your limit due to the fridge issue ? I used to have a map that appeared along the left side of the blog, which pinpointed our location. It has vanushed, and I have no idea why. Will try to resurrect it, Neil – thanks for reminding me. Some if these little computer things take me forever to figure out! I’m a nap kind if person, and like to see that, too. Oh, we can deal with longer than three nights. 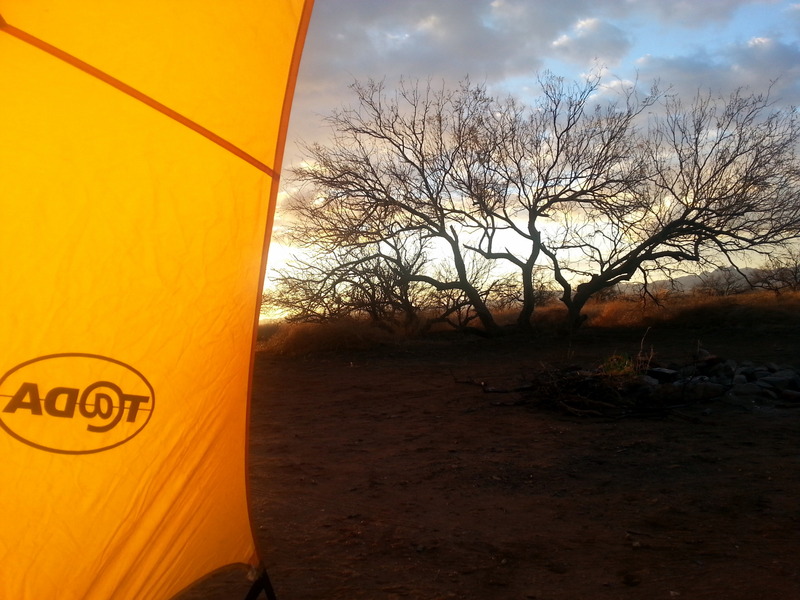 But we are meeting some T@DA friends at Lost Dutchman SP in about 10 days, and are trying to pace ourselves to get there! We didn’t have a reservation. It’s pretty busy here – when we asked for a spot for three nights, there were only four possible sites. Others were available, but would have required a move. NOT! I’d reserve, if I were you – many of the sites are smallish, and I know that your rig is substantially longer than ours. Don’t get sucked into either of the two sites on the far eastern end if the campground tho……they are awful. Dozens of people walking right next to your rig hourly. They would be awful, and a huge PITA to back into! ( I’m just saying’). With your love of birds and photography, it seems like you would really enjoy a stay here. Crowded, but very quiet.